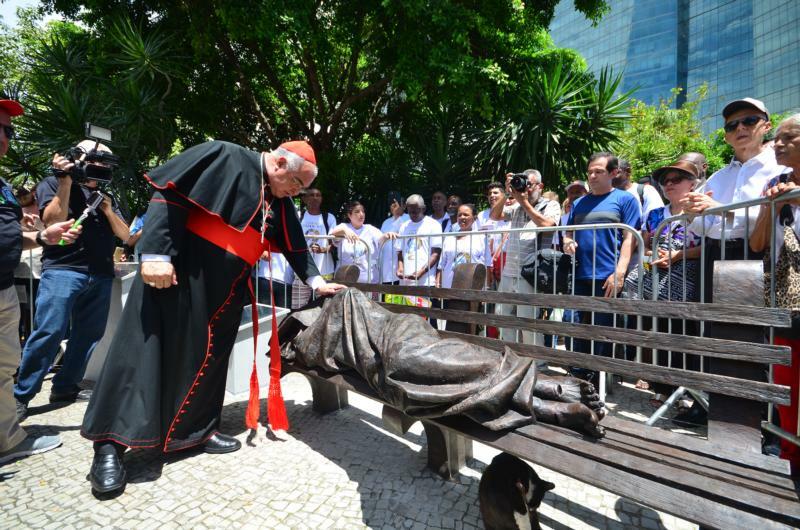 RIO DE JANEIRO (CNS) — Cardinal Orani Tempesta of Rio de Janeiro blessed the sculpture “Homeless Jesus” Nov. 18, ending a weeklong series of events by Brazil’s Catholic Church to celebrate World Day of the Poor. The sculpture was donated to the archdiocese by Canadian artist Timothy Schmalz and was placed outside Metropolitan Cathedral. The gift of the statue to the city of Rio de Janeiro was made possible by the Brazilian Embassy to the Holy See and the Knights of the Holy Sepulcher. In the life-sized image, made in bronze, Jesus appears lying on a bench, with a blanket over his body and his bare feet uncovered. Visitors to the cathedral quickly recognized the figure of Jesus due to his feet, where it is possible to see the marks of the nail holes that would have pinned him to the cross. “The sculpture makes us look at those who live on the streets of our city as brothers and sisters; Pope Francis asks us to see Christ in the figure of the poor who live on our streets,” the cathedral’s parish priest, Father Claudio Santos, explained to reporters. The original sculpture produced by Schmalz was installed in Toronto in 2013. Since then, copies have been installed in Dublin and Rome, as well as in several U.S. cities, including Davidson, North Carolina; Chicago; and Austin, Texas.